One of our graduate assistants came in recently with an old newspaper that her husband had found on a deconstruction job. 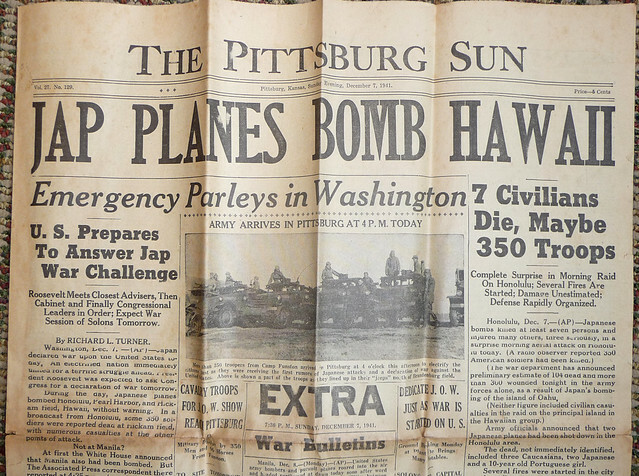 Considering that it was, apparently, stored in a wall for decades, the December 7, 1941 Pittsburg Sun was in fairly good condition: brittle, but almost entirely intact and clear. I didn’t want to force the folds into a flatbed scanner – the paper clearly isn’t going to survive too much handling, and the next step is to show it to our archivist – so I took some pictures with my camera to share. Interestingly, we got an email today indicating that the Governor has declared today a half-staff day, in honor of the anniversary, so consider this our contribution to the remembrance.